The neurosensory organ comprising semicircular canals, called the ampullary crest, a protrusion found in the ampulla. It is made up of support cells and sensory cells. type II cells, cylindrical in shape. 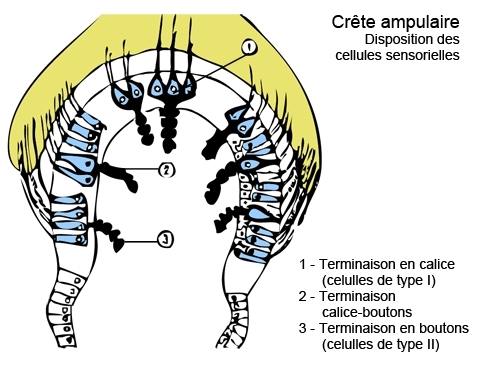 Extending out from the apex are the cilia comprising the kinocilium, or auditory hair cell, and some fifty smaller stereociliae that appear like the pipes of a church organ, in decreasing order of length extending out from the kinocilium. The crest makes up a third of the diameter of the ampulla. 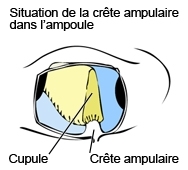 It is covered in a gelatinous substance that forms the cupula and reaches up to the roof of the ampulla, obstructing the lumina of the semi-circular canal. 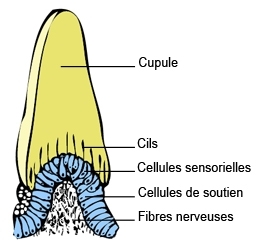 The cupula is traversed by long ducts which mark the start of the cilia of the sensory cells.